Venezuelan debt crashed and burned last week as described in this article. 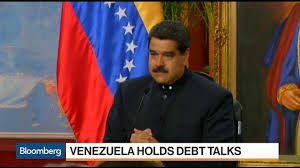 The major state-owned oil company, Petroleos de Venezuela SA, or PDVSA, defaulted on its debt. S&P and Fitch ratings declared the company to be in default. The International Swaps & Derivatives Association (ISDA, the rule-making body on over-the-counter derivatives) declared PDVSA credit default swaps to be payable also. The PDVSA is likely to be the first of many Venezuelan defaults. Government debt looks unpayable, and is currently being renegotiated, which is another kind of default. Other Venezuelan companies with dollar-denominated debt are in worse shape. None of this comes as a shock. Venezuelan credit has been deteriorating for over a decade under the rule of first Hugo Chavez, and now Nicolás Maduro. The Venezuela currency, the bolívar, is essentially worthless and civil society has descended into chaos bordering on civil war. Yet, the significance of this story goes far beyond Venezuela. The 1998 global financial crisis started with a simple Thai default in 1997. The 2008 global financial crisis started with an uptick in mortgage defaults in 2006. Financial crises have a “snowflake and avalanche” dynamic in which small catalysts (the snowflake) soon cause catastrophic results (the avalanche). The Venezuelan crisis definitely has the potential to spread to other emerging markets and possibly cause a new global financial crisis in 2018.